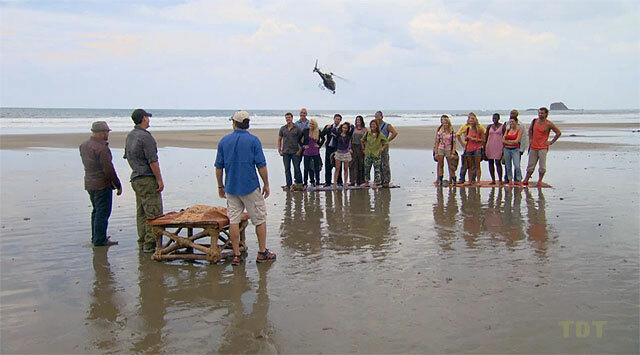 Pre-game Ep1: "You're Looking at the New Leader of your Tribe" Ep2: "You Own My Vote" Ep3: "Keep Hope Alive"
Contestants are flown in by military plane, unloaded, then wait for a helicopter to deliver two returning players, Rob & Russell. Rob draws an Ometepe buff, Russell a Zapatera one. 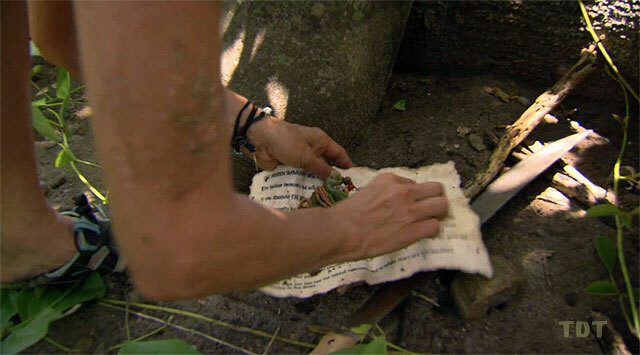 Idol hands: (Apparently on Day 1) Kristina finds the Ometepe hidden immunity idol, without benefit of an idol clue. Tribes must slide four heavy blocks along a rail to form a staircase. They run up the stairs to a platform, where one person (Matt, Ralph) chops through ropes, releasing a second set of stairs. After climbing the stairs, they assemble a large pyramid-shaped block puzzle. Zapatera wins immunity and flint. Ep1 RC/IC: "Push It Uphill" - Zapatera wins. 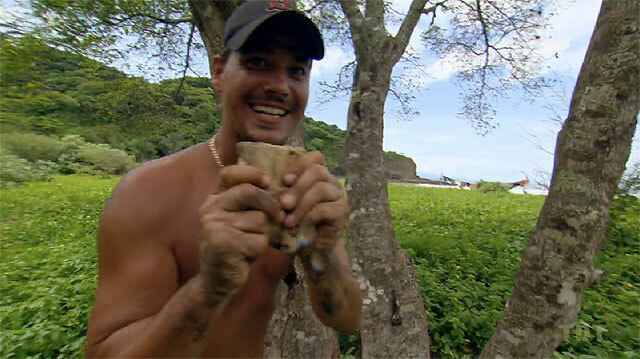 While collecting rocks, Ralph finds the Zapatera idol hidden under a rock that's sitting in a hole in a log. Way to hide it, SEG. David sits out. 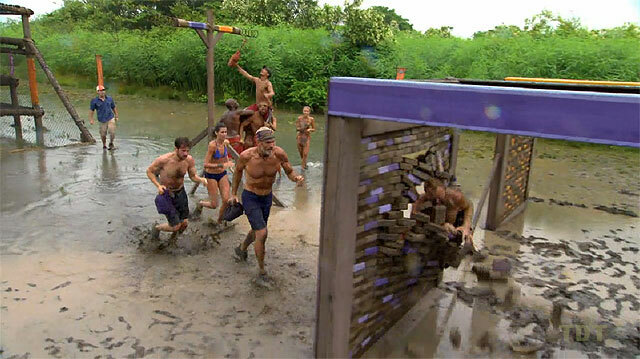 Five members of each tribe swim out, climb a ladder, jump off, smash a tile, retrieve a key, swim back. After getting all five keys, one person (Stephanie, Natalie) unlocks three locks on a crate containing a ball. The remaining two (Ralph & Krista, Phillip & Kristina, but actually only Ralph and Phillip) throw the ball to smash five tiles. 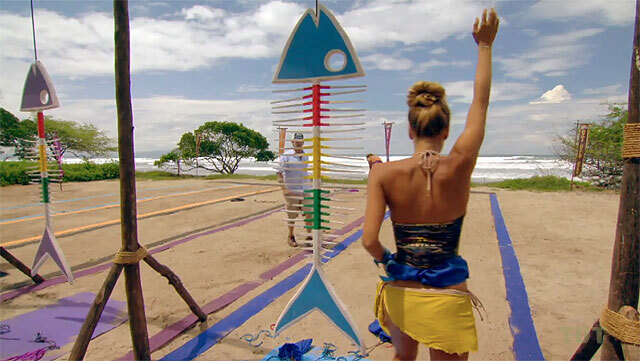 Zapatera wins immunity and fishing gear. Ep2 RC/IC: "Smash, Grab, Smash"- Zapatera wins. Andrea & Ashley, Steve & David watch. Matt and Francesca must tie sticks together to retrive three keys, to open a 'jail' door. Despite an early 2-0 lead for Francesca, Matt wins, and Francesca is eliminated. Ep3 Duel: "Jail Break" - Matt wins, Francesca out (1). Ep3: "Keep Hope Alive" Ep4: "Don't You Work For Me?" Ep5: "We Hate Our Tribe"
Ralph and Sarita sit out. Re-using the dunking wheel from Nicaragua, each tribe straps three people (Andrea, Natalie, Kristina; Stephanie, Krista, Julie) to a wheel that goes underwater. The three take a mouthful of water, then spit it out into a tube at the top. Once full, the tube tips, releasing a ball. 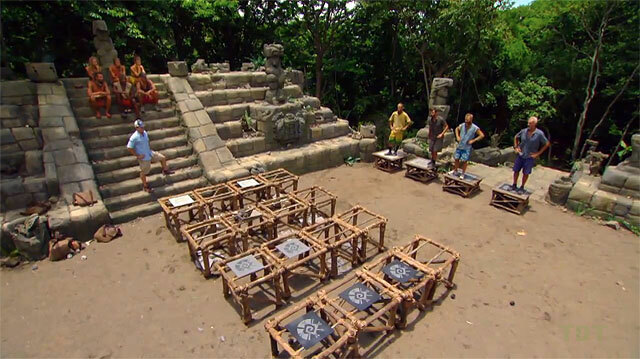 The last person (Rob, David) does a slide puzzle that turns into a table maze, which they run the ball through. 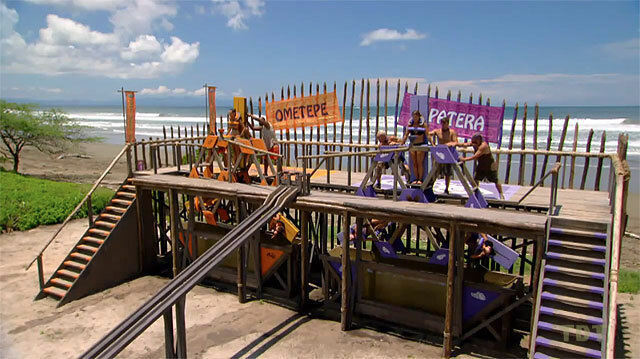 Ometepe 'wins' when David throws the puzzle leg. Ep3 RC/IC: "Spin Cycle" - Ometepe "wins." TC3 - Russell voted out (3-3-3 [5-1]), goes to R.I.; 15 left. Phillip & Kristina, Sarita & Ralph watch. 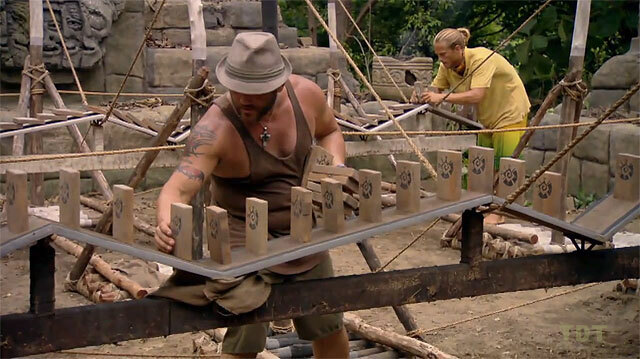 Russell and Matt must arrange domino-like wood pieces on a crooked track, then knock them over to release a ball, and break a tile. After each makes a failed try, Matt wins, Russell is eliminated. Russell cries, then outs all of Zapatera's secrets to Phillip and Kristina. 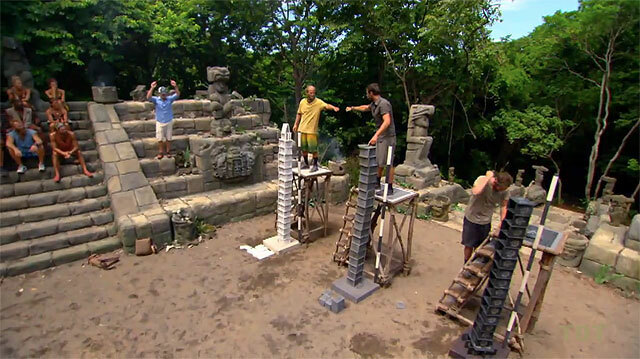 Ep4 Duel: "Domino Effect" - Matt wins, Russell out (2). 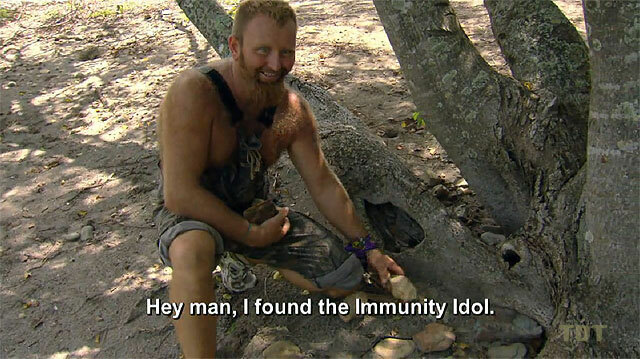 Ep4 Idol (Day 10, during the duel): After coming up with a 'beach day' trip to get the tribe away from camp, and a 'constipation' excuse for ditching it, Rob finds the Ometepe idol after minutes of searching. Krista sits out. Ralph, Rob use crowbars to uncrate shovels. Julie, Grant dig up hatchets. Ralph, Rob chop through log/rope to release saws. Steve/Mike, Phillip/Grant saw off planks. Stephanie/Sarita, Rob/Kristina do plank puzzle. Stephanie, Ashley untie knots on hammers. Ralph drives nails to break tiles. Andrea, Natalie, and David do absolutely nothing. Zapatera wins immunity, barbecue items and food. Ep4 RC/IC: "Toolin' Around" - Zapatera wins barbecue items. TC4 - Kristina voted out (4-3), goes to R.I.; 14 left. Rob & Grant, Krista & Stephanie watch. 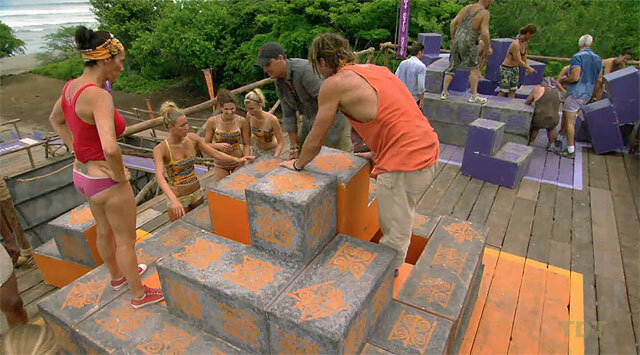 Matt and Kristina must each do a slightly smaller version of the pyramid puzzle from the Ep1 RC/IC. Matt wins, Kristina is eliminated. Ep5 Duel: "Cube Crisis" - Matt wins again, Kristina out (3). Krista sits out. Julie, Steve sit out. 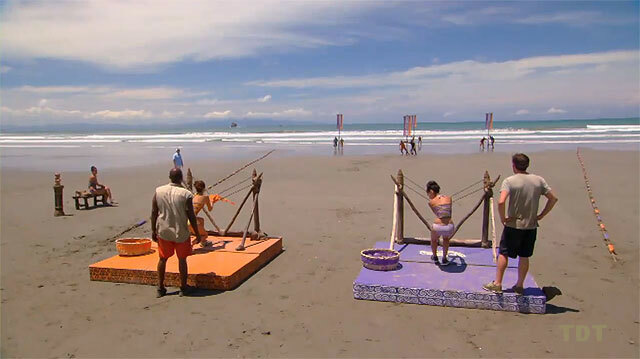 Rob & Stephanie are callers, directing blindfolded tribemates through a maze to bags of puzzle pieces. Once all four bags are retrieved, Rob & Stephanie do a word puzzle ('The sweet taste of victory'). Ometepe wins immunity, coffee, and pastries. Ep5 RC/IC: "Smoko" - Ometepe wins coffee, donuts. TC5 - Krista voted out (6-2), goes to R.I.; 13 left. Ep6: "Their Red-headed Stepchild" Ep7: "It Don't Take a Smart One" Ep8: "This Game Respects Big Moves"
Julie & Mike, Andrea & Natalie watch. Matt and Krista must use a grappling hook to retrieve three bags, then remove a ball from a bag and roll it through a table maze. Matt wins, Krista is eliminated. Krista gives Matt her Bible before leaving. 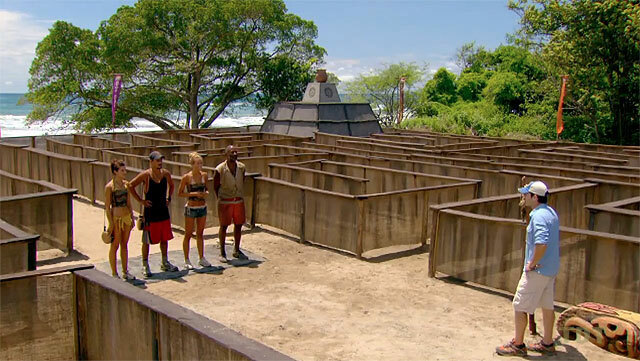 Ep6 Duel: "Grapple & Maze" - Matt wins yet again, Krista out (4). Sarita sits out again. David & Stephanie, Phillip & Natalie (mostly Natalie) launch the balls. First tribe to five catches wins. Grant catches four, Boston Rob one for Ometepe. Ometepe wins immunity, and lunch at a Jesus statue. Ep6 RC/IC: "Beach Balls" - Ometepe wins immunity, lunch at a Jesus statue. TC6 - Stephanie voted out (5-2), goes to R.I.; 12 left. David & Ralph, Rob & Phillip watch. Matt and Stephanie take turns making pairs by flipping over two of 20 concealed tiles. Matt wins, 5-3. Stephanie is eliminated. Ep7 Duel: "Concen-tration" - Matt wins again, Stephanie out (5). In a rehash of the Three Little Pigs challenge from Nicaragua, tribes go through hay, remove a ball bag, go through mud crawl, collect another ball bag, go through sticks/rope obstacle, then a net crawl, another ball bag, then crash through a 'brick' wall, and shoot baskets. First tribe to sink all six balls wins. 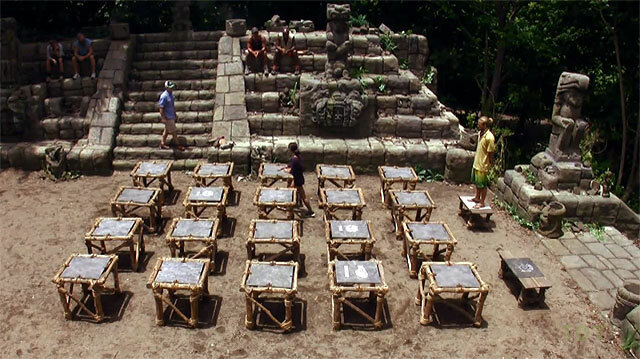 Grant makes 4/6 of Ometepe's shots, Ometepe wins immunity, volcano picnic. 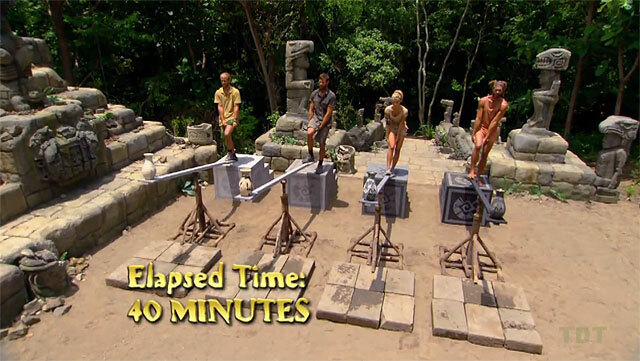 Ep7 RC/IC: "Crash Course" - Ometepe wins immunity, volcano picnic. Both tribes watch. Matt and Sarita must stand on a pair of increasingly narrow ledges. Eventually (on the thinnest ledges), Sarita falls off, and Matt wins. 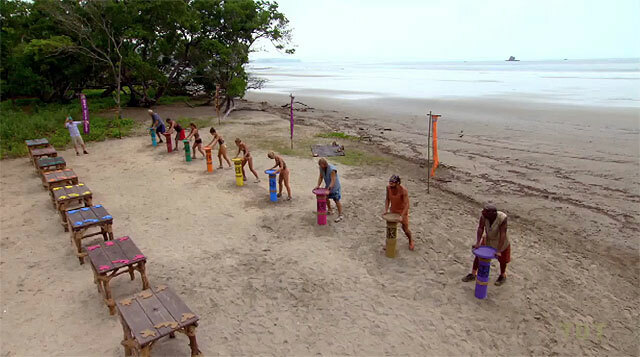 Sarita is eliminated, Matt re-enters the game, and the tribes merge to form Murlonio. Ep8 Duel: "Chimney Sweeps" - Matt wins; Sarita out (6). Matt re-enters game, 12 left. <-- Ep8 Ep9: "The Buddy System" Ep10: "Rice Wars"
First individual IC. 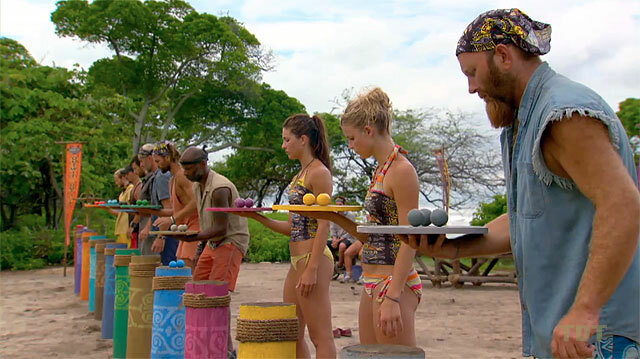 Contestants must balance balls on a plate. One in the first round (Julie is first out), then two (Ashley, David out), then three (Andrea, Grant, Matt, Rob, Phillip, Ralph, Steve, Mike out). Natalie wins. Ep8 IC: "Rollerballs" - Natalie wins. TC8 - Matt voted out again (6-5-1), goes back to R.I.; 11 left. First round: Dig up club, undo knots, break tile. Julie, Ralph, Grant, Mike, David, Steve reach second round (filling tubes with water). Grant, David, Mike make third round (puzzle). Grant wins. Ep9 F11 IC: "Meso Soup" - Grant wins. TC9 - Mike voted out (6-5), goes to R.I.; 10 left. Contestants have the choice of competing or eating cheeseburgers. Phillip and Steve opt out to stuff their faces; everyone else competes. 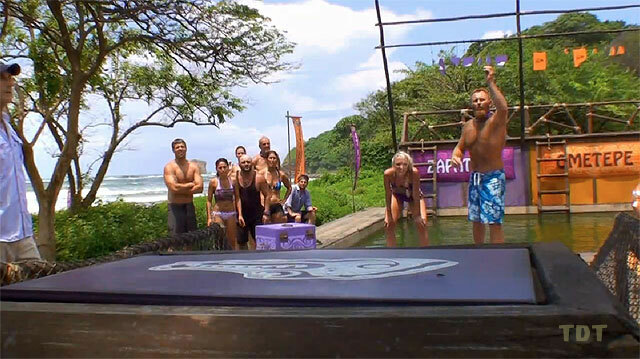 Contestants must hang from a metal bar over a pool, until one remains. Rob 1st out, Julie 2nd, Grant 3rd, Ralph 4th, David 5th, Ashley 6th, Natalie 7th, Andrea wins. Ep9 F10 IC: "Gang Hang" - Andrea wins. Everyone watches. Contestants must build a stack of cards to a certain height. Mike finishes first, Matt second, both remain active. David is eliminated, but is the first juror. Ep10 Duel: "House of Cards" - Mike wins, Matt 2nd; David joins jury (1). First round: contestants must spin around a disk to remove it from a pole, take it to a table, then do a simple 6-piece puzzle in it. Second round: A slightly tougher 14-piece puzzle. Rob wins. Ep10 IC: "Mayan Pizza" - Rob wins. TC11 - Julie voted out (6-3), goes to R.I.; 8 left. Ep11: "A Mystery Package" Ep12: "You Mangled My Nets" Ep13: "Too Close for Comfort"
Everyone watches. 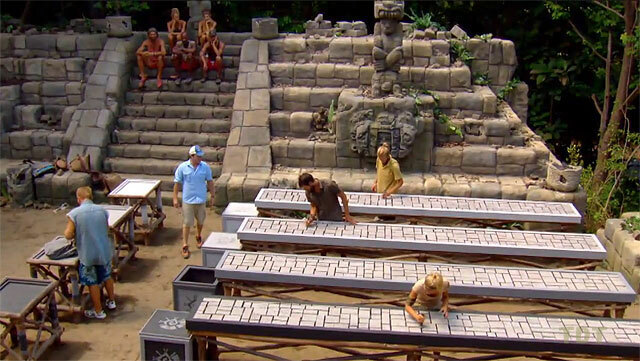 Contestants must land three pucks in the end zone to stay alive. Matt finishes first, Mike second, and remain active. Julie is eliminated, becomes the second juror. 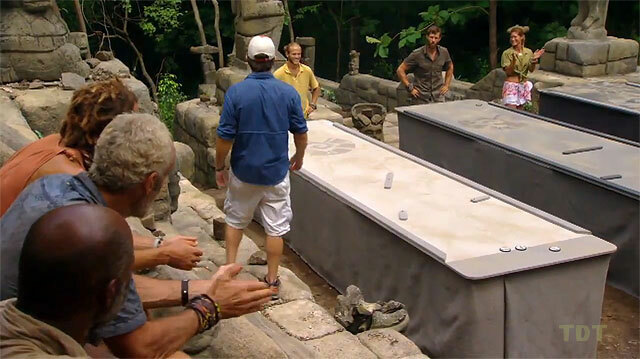 Ep11 Duel: "Survivor Shuffle Board" - Matt wins, Mike 2nd, Julie joins jury (2). One-on-one log-rolling contest. Round 1: Grant beats Rob, Ashley beats Andrea, Ralph beast Steve, Phillip beats Natalie. Round 2: Grant beats Ashley, Ralph beats Phillip. Round 3: Grants wins, gets immunity plus two minutes to eat chocolate cake and milk, which he shares with Rob and Andrea. Ep11 F8 IC: "Log Jam" - Grant wins. TC12 - Ralph voted out (6-2), goes to R.I.; 7 left. Held at Tribal Council immediately after Ralph leaves. Probst flashes a series of seven cards. Contestants must show him each card, one at a time, and are out if they make an error. Natalie, Phillip out on 4th card; Grant, Andrea on 5th; Ashley, Steve on 6th. Rob wins. Ep11 F7 IC: "Memory" - Rob wins. TC13 - Steve voted out (6-1), goes to R.I.; 6 left. 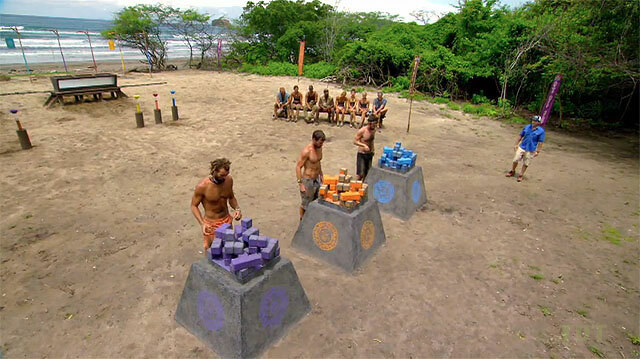 Ep12 Duel: "Rock Block" (Family visit) - Mike 1st, Matt 2nd, Ralph 3rd; Steve joins jury (3). Mike gives family visit to six remaining Ometepe. Ep12 IC: "Step On It" - Rob wins. TC14 - Andrea voted out (5-1), goes to R.I., 5 left. Everyone watches. Contestants must guide a handle through a table maze, use it to smash a tile, retrieve a puzzle bag, then complete the puzzle. Mike finishes first, Matt second, Andrea third, and remain active. Ralph is eliminated, becomes the fourth juror. 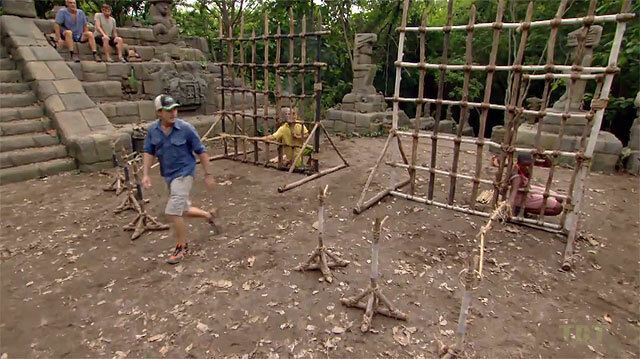 Ep13 Duel: "A Maze N' Jig" - Mike 1st, Matt 2nd, Andrea 3rd; Ralph joins jury (4). With one hand tied down, contestants must retrieve puzzle bags with a series of hooks, and complete a fish puzzle, which can be assembled in any order as long as the bones don't touch each other. Ashley wins. Ep13 IC: "Bone to Pick" - Ashley wins. TC15 - Grant voted out (4-1), goes to R.I. (4 total there); 4 left in game. Everyone watches. Contestants must keep a vase balanced on the end of a seesaw until it falls. Grant's falls first (5th juror), then Matt's (6th juror), then Mike's (7th juror). 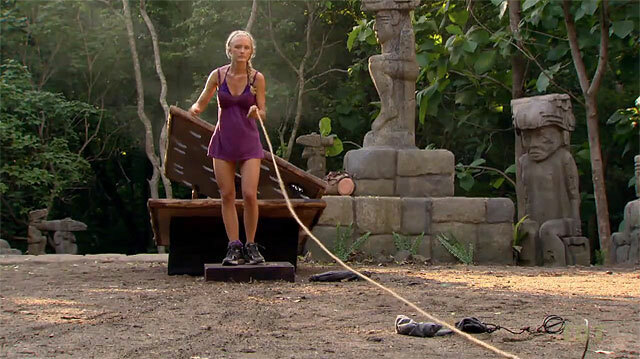 Andrea wins, re-enters the game. 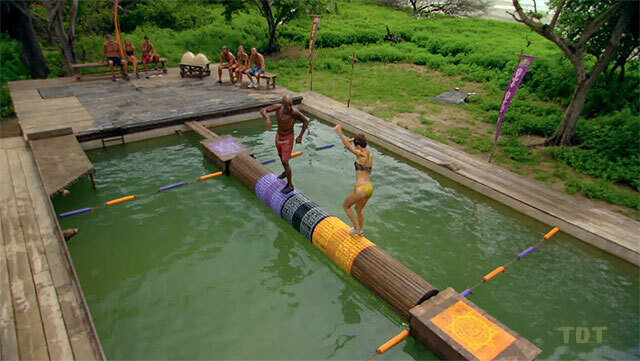 Ep14 Duel: "A Leg Up" - Andrea wins, re-enters game. Grant, Matt and Mike all join jury (7). 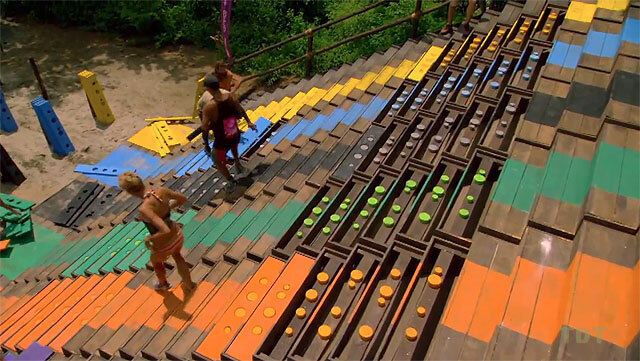 Contestants must cross a balance beam, and retrieve four sets of puzzle bags (one at a time) with 10, 20, 30, or 40 tiles, numbered 1-100. Tiles must be placed in numerical order. Yep, that's all there is to it. Ashley wins. Ep14 F5 IC: "A Numbers Game" - Ashley wins. TC16 - Andrea voted out again (4-), joins jury (8); 4 left. Contestants must traverse a giant maze to four stations containing puzzle bags. They must then decode a word puzzle ('Only you are safe'). Rob wins. Ep14 F4 IC: "Meso Maze" - Rob wins. TC17 - Ashley voted out (3-1), joins jury (9); 3 left. Rob wins, 8-1-0 over 'Phile' and Natalie, respectively. 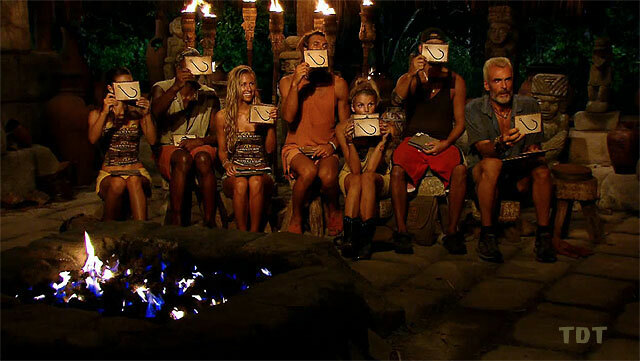 Final Tribal Council, jury votes on Final Three. Rob wins, 8-1-0 over Phillip and Natalie.